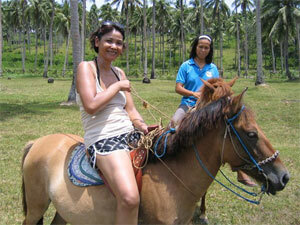 Many of the holidays we arrange in the Philippines are suitable for single travellers. In fact the Philippines is such a friendly country, and its people so warm and welcoming, that it could be the most ideal country for solo travellers to explore! All our guests are met on arrival into the Philippines, and are transported to their accommodation. Most of the itineraries we devise are bespoke, or fine-tuned, to fit in with customers' arrival and departure flight dates and times. We meet and greet, take care of transfers and local tours (some of which are small group), and there are always people waiting to meet clients at various destinations and resorts. Philippine Trails has a great back-up team of staff and associates, both in Manila, and throughout the country, to ensure every holiday goes smoothly. Internal flights and ferry tickets are priced individually of course, so there is no disadvantage for the solo traveller in that respect. For other land transfers, to the Rice Terraces of Luzon, or traversing Palawan from Puerto Princesa to El Nido, for example, we can incorporate shared air-conditioned coach or mini-bus travel. We'll include accommodation which we feel is good value for solo travellers, as hotels and resorts normally charge by the room. For local excursions, we will endeavour to place clients with small groups - on treks, diving, and island-hopping for example. Some excursions, such as the Underground River Tour in Puerto Princesa, are only run in small groups, that participants join at the time. We can recommend a Philippines tour that is suitable to single travellers on a budget, where costs can be kept down, but a full experience still enjoyed. Simply let us know what you're looking for. Existing itinerary recommendations can be amended to suit a solo traveller wherever possible, so do get in touch. 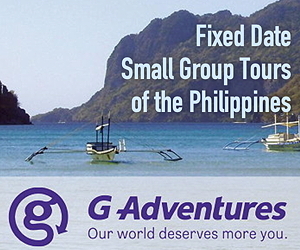 View G Adventures Philippines Tours via the link below. Get in touch if you need any help or advice.